Convergent Design announced that their Solid State Drives in 256GB, 512GB and 1TB capacities for their popular 4K Raw recorder/monitor Odyssey7Q+ and their portable video switcher Apollo are now guaranteed for 10 years. This is particularly exciting for video professionals as now they can rest assured their Odyssye7Q+s and Apollos are even more bulletproof than ever before. This entry was posted in Accessories, News and tagged SSD, Convergent Design Apollo, Apollo, Accessories, Convergent Design Odyssey7Q+, Odyssey7Q+, Convergent Design on 24th March 2016 by Visuals. Anton Bauer's new CINE range of digital cinema camera batteries were recently used to power the RED Weapon on a major Coca-Cola & Tinder commercial for the holidays. The new CINE range from Anton Bauer sport a revolutionary uniform cube shape without stressing your rig with any additional weight or bulk. This entry was posted in Accessories, News and tagged Commercials, Gear, Anton Bauer, Anton Bauer CINE Batteries, Accessories on 11th March 2016 by Visuals. At BVE 2016 we stopped by the Global Distribution stand to check out their latest Shape accessories and shoulder rigs for the Sony FS7 and FS5. In addition we take a look at the Shape cage for the Atomos Shogun 4K recorder featuring Shape's push-button technology and handles. This entry was posted in BVE, Accessories, Cameras, News and tagged Shogun Cage by Shape, Son FS7 Shoulder Rig by Shape, Shape, Shape Sony FS7 Accessories, Accessories, Atomos Shogun on 10th March 2016 by Visuals. BVE 2016 isn't all about cameras, and even though they are everywhere simply because manufacturers have to use them to display their accessories whether it be wireless solutions, lenses or monitors. We stopped by the TV Logic and Holdan booths where we saw a few new models that might be of interest to some of you. 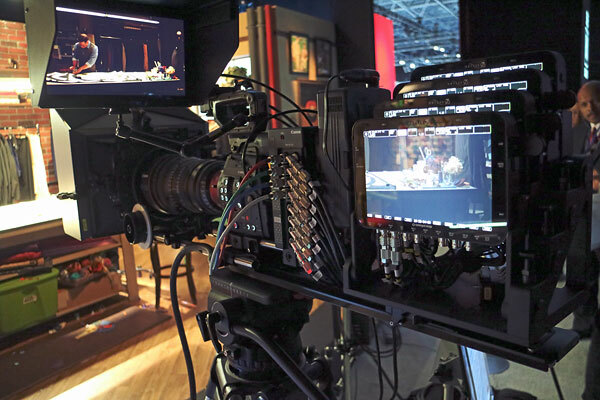 This entry was posted in BVE, Accessories, News and tagged TV Logic, BVE 2016, SmallHD 702 Lite, SmallHD 701 Lite, SmallHD, Accessories, Monitors on 7th March 2016 by Visuals.